BLUE DOLPHIN HAS BEEN SOLD. HER NEW OWNER IS ERIC GORDON. 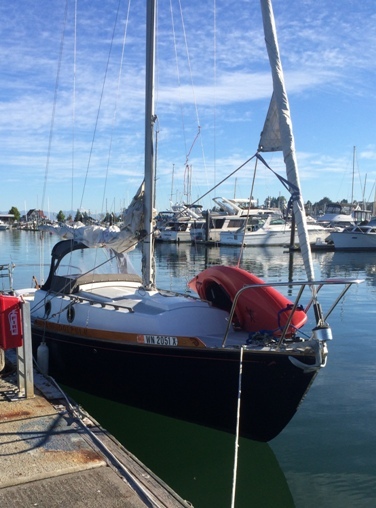 HE PLANS TO MOVE BLUE DOLPHIN TO THE EVERETT, WASHINGTON HARBOR NEXT WEEK. I THINK HE WILL BE INTERESTED IN JOINING THE DOLPHIN WEB SITE. THANKS AGAIN FOR YOUR HELP IN POSTING HER FOR SALE. MUCH APPRECIATED. I HAVE DOWNSIZED TO A COMPAC 19 THAT SUITS MY NEEDS. I just went online to do more research of my beautiful new Yankee, (hull #246) and I see Lon already updated you. I was pleased to see my name as the owner, thanks for the warm welcome! I am proud and truly thrilled to own this classic boat, she sailed beautifully from Port Townsend to Everett on the 8 hour journey. Lon has taken wonderful care in bringing her back to life, and I am looking forward to many wonderful days on the water. VERY NICE YANKEE DOLPHIN 1971, HIN#246. 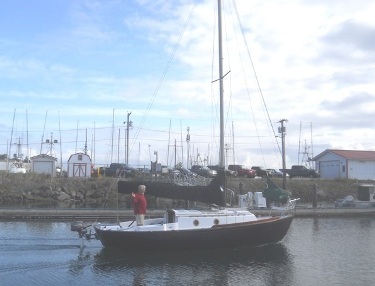 BOAT IS IN PORT TOWNSEND , WASHINGTON WHICH IS JUST NORTH OF SEATTLE. HERE IS A LIST OF WHAT HAS BEEN DONE. Draft (max.) 2.83' ; Displacement: Ballast: 1650 lbs. . 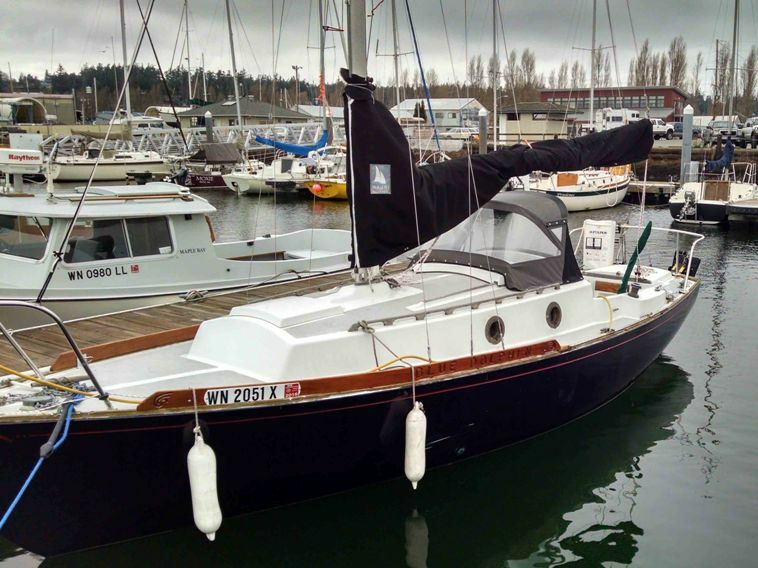 I JUST PURCHASED A YANKEE DOLPHIN 24. THE TITLE SAYS IT IS HULL NUMBER 246. I HAVE NOT FOUND THE ACTUAL NUMBER ON THE HULL YET, BUT I WILL. NO PICTURES YET, SHE HAS SUFFERED BENIGN NEGLECT FOR SOME TIME AND SHOWS THE RAVAGES OF OF MANY SEASONS IN OLYMPIA WITHOUT TLC. 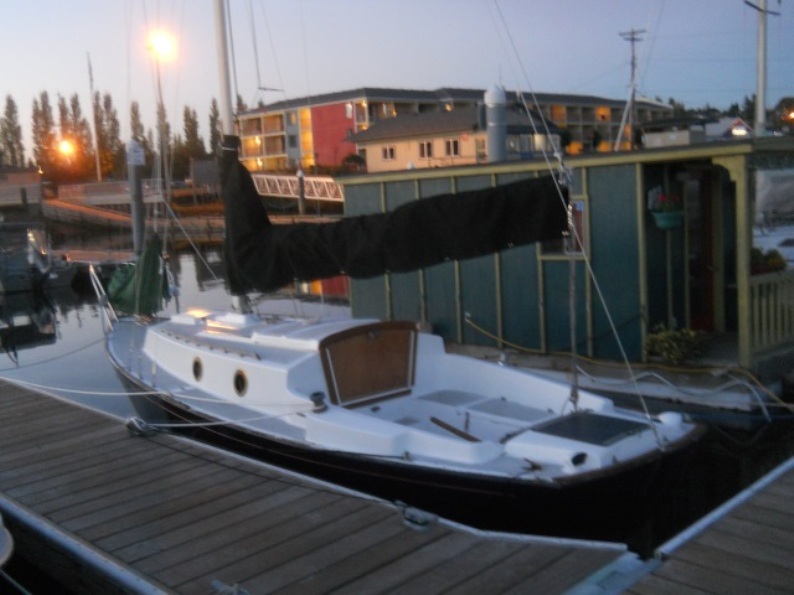 I BOUGHT HER IN OLYMPIA AND MOTORED UP TO PORT TOWNSEND WHERE SHE WILL BE BERTHED. IN THREE WEEKS, I WILL POST "AFTER" PHOTOS. I NOTICED THERE WAS CONFUSION ABOUT HULL #246. 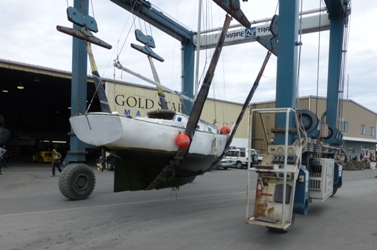 JEFF GABLE CLAIMED TO HAVE IT , THEN CHANGED HIS MIND TO CLAIM HULL #267. IT WOULD BE GOOD TO CORRECT THIS IN THE HULL NUMBER ROSTER. ELIMINATE THE ERRONEOUS CLAIM TO HULL #267. DONE! Postscript INTERESTING TO PIECE TOGETHER WHAT EVER HISTORY IS POSSIBLE. THERE IS A PLAQUE IN THE SALOON WHICH SAYS "SECOND PLACE IN THE AROUND THE SOUND RACE - 1973". BE FUN TO KNOW WHO WAS DRIVING THE BOAT AT THAT TIME. THE STANDING RIGGING LOOKS QUITE NICE. I AM CURIOUS IF ANY PAST OWNER MIGHT KNOW IF IT HAD BEEN REPLACED? JODY SMITH SOLD ME THE BOAT. HE SAID THAT PRIOR TO HIS OWNER SHIP THE BOAT HAD SAT UNUSED IN OLYMPIA FOR ABOUT TEN YEARS. JODY USED IT OCCASIONALLY FOR THE PAST COUPLE OF YEARS . WHEN I BOUGHT THE BOAT, THERE WAS NO NAME ON IT. APPARENTLY IT WAS NAMED ALLYSSUM AT ONE POINT. I PLAN TO PUT HER IN FINE CONDITION AND USE HER QUITE A LOT. HER NEW NAME WILL BE "BLUE DOLPHIN". Post postscript THE BOAT WILL BE BLUE SOMETIME AFTER THE 15TH. I AM IN THE QUEUE FOR HAUL OUT HERE IN PORT TOWNSEND. 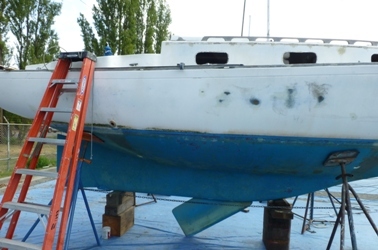 I HATE TO HAUL OUT IN THE SUMMER - THAT IS WHEN WE SHOULD BE SAILING, BUT THIS BOAT NEEDS SOME ATTENTION SO I WILL REPLACE THE THRU HULLS, AND DO SOME PAINTING. WE HAVE BEEN WORKING ON THE TEAK WHILE WAITING FOR HAUL OUT. June 18, 2014. We got a couple of emails from Lon regarding thru hull fittings and cockpit drains which we have also posted in our Technical Section on this subject. Click here to go there. I JUST FINISHED READING THRU THE COMMENTS ON THRU HULLS. 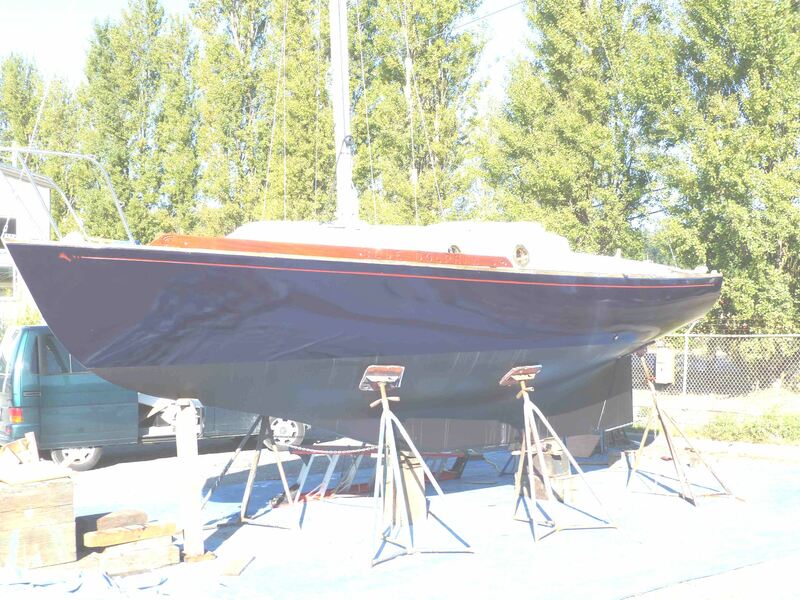 BLUE DOLPHIN'S THRU HULLS LOOK LIKE SOME OF THE BAD PHOTOS POSTED. I PLAN TO ELIMINATE THE TOILET THRU HULLS AND USE A COMPOSTING TOILET. HAS ANYONE TRIED PUTTING THE COCKPIT DRAIN VERTICALLY AT THE REAR OF THE COCKPIT SO IT WOULD DRAIN TO THE OUTBOARD WELL? THE FLOOR IN THE OUTBOARD WELL SLOPES DOWNWARD AND AFT AND THERE IS ALREADY A DRAIN OPEING AT THE AFT END OF THE MOTOR WELL. I HAVE SEEN THIS DONE ON MONTGOMERY 17s AND IT WORKS WELL. I PUT A LEVEL ON THE COCKPIT FLOOR OF MY BOAT AND IT SHOWED IT TO BE LEVEL. IT MIGHT BE POSSIBLE TO CAUSE DRAINAGE IN COCKPIT TOWARD THE MOTOR WELLDIAGRAM BELOW TO SHOW REAR COCKPIT DRAINS INTO MOTOR WELL. Webmaster Note: The cockpit drain thru hulls issue is one of my favorite worries. Marionette has a different type of transom well but that's no excuse. More comments on this subject are included in the Technical Section - click link above. And more comments from readers are solicited. I RECALL TELLING YOU THAT I HOPED TO HAVE BLUE DOLPHIN COMPLETE IN ABOUT THREE WEEKS. THAT WAS BACK IN JUNE SOMETIME. WELL IT TURNED OUT CLOSER TO THREE MONTHS AND THERE IS STILL A BIT OF WORK TO DO. Click on the pictures for a larger view - anybody notice the portlights? ON THE COCKPIT DRAINS I SIMPLY GLASSED OVER ALL UNDERWATER THRU HULLS AND PUT THE COCKPIT DRAINS AT THE WATER LINE. 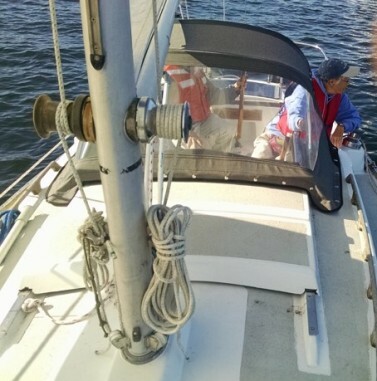 I CROSSED THE CONNECTING HOSES -- SO THE PORTSIDE DRAIN CONNECTS TO THE STARBOARD THRU HULL. THEY DRAIN JUST FINE. I FILLED THE COCKPIT WITH WATER TO GIVE THEM A TEST. THE LAST BIG RAIN HIGLIGHTED A PROBLEM WITH LEAKING ALONG THE STARBOARD CAP (TOE) RAIL. I PULLED THE TEAK CAP RAIL OFF AND REMOVED THE CRUMBLING CAULK, RE-DRILLED ALL THE SCREW AND BOLT HOLES , FILLED WITH THICKENED EPOXY. I ALSO EPOXIED THE BOTTOM OF THE TEAK CAP RAIL. THEN 3M 4000 AND REINSTALL THE CAP RAIL. I THEN RAN THE WATER HOSE ON IT FOR 10 MINUTES WHILE I SCAMPERED BACK AND FORTH DOWN BELOW CHECKING FOR LEAKS. NONE! THANK GOODNESS. Postscript: THE ROUND PORTLIGHTS WERE MY CHANGE. IT TURNED OUT TO BE MORE WORK THAN EXPECTED. WE CUT OUT THE LINER IN THE PORTLIGHT AREA AS ONE LARGE RECTANGLE AND THEN REPLACED THAT VOID WITH AIREX FOAM. THEN GLASSED OVER THE AIREX AND FAIRED OUT THE WORK. THEN I WENT BACK AND CUT HOLES FOR THE ROUND PORT LIGHTS. 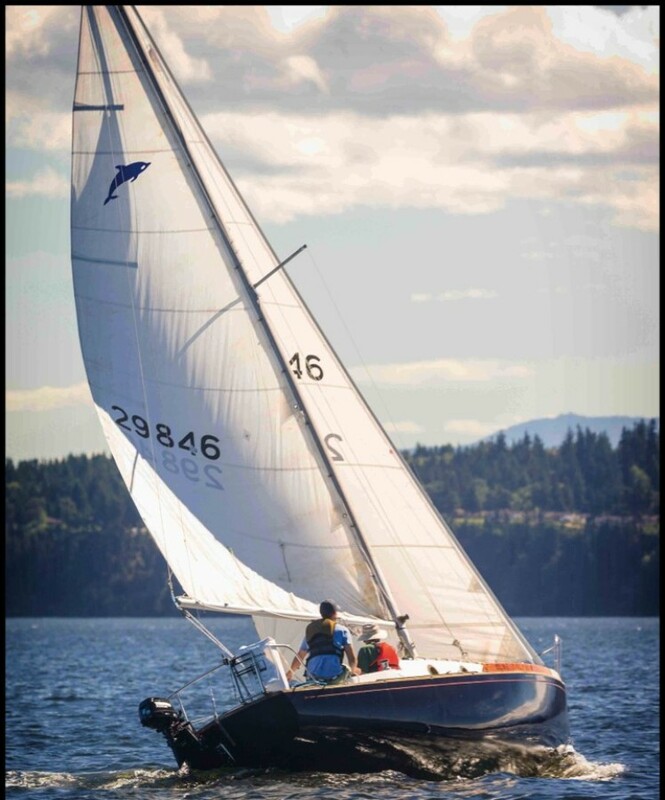 We have added Lon's comments to the relative articles in the Technical Section - for Thru Hulls - click here, and for motor lift systems click here. October 4, 2014. We got the following email from Lon regarding his new composting head. HERE ARE SOME PHOTOS OF THE "C-HEAD CUTAWAY BASE MODEL" JUST INSTALLED IN MY DOLPHIN 24. C-HEAD COMPOSTING TOILETS HAS A NEW MODEL COMPOSTING TOILET DESIGNED FOR THE MACGREGOR 26M. IT IS CALLED THE "CUT AWAY BASE MODEL". 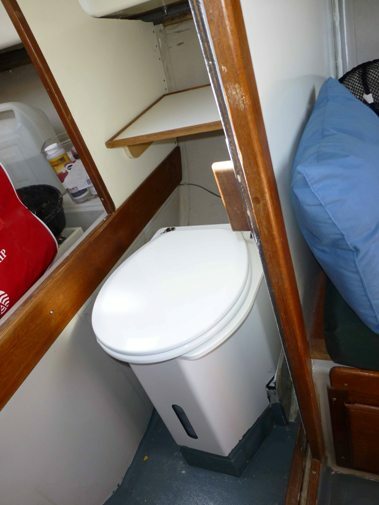 FOR THOSE ACCUSTOMED TO THE JOYS OF PORTA POTTIS, A COMPOSTING TOILET IS A REFRESHING CHANGE. NO ODORS, NO TRUDGING UP THE GANGWAY WITH A PERILOUS LOAD OF LIQUID/SOLIDS FROTHING AWAY. ARTICLE LOOKS GOOD. I WILL KEEP AN EYE OUT FOR OTHER STORIES ABOUT DOLPHINS AND SAIL HANDLING IN BRISK CONDITIONS. I NOTICED THAT NOGLES HAD CUT TWO FIVE INCH SCUPPER DRAINS LEADING TO THE OUTBOARD WELL AND THEN TO A RUBBER FLAPPED OPENING. THAT IS SIMILAR TO WHAT I HAD CONSIDERED A WHILE BACK. I DID NOT FOLLOW THRU WITH THAT IDEA. 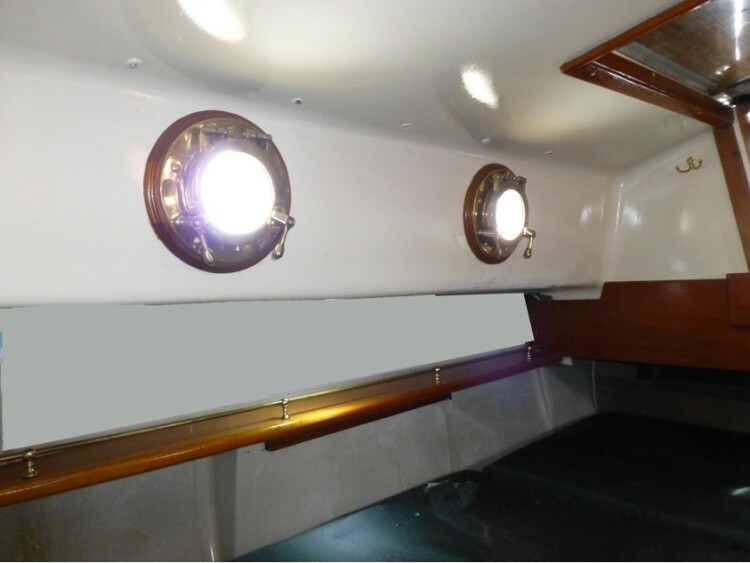 I SEALED ALL BELOW WATERLINE THRU HULLS AND LED HOSES ACROSS TO ABOVE WATERLINE THRU HULLS FOR THE TWO EXISTING COCKPIT DRAINS. I ALSO LIKED HIS IDEA FOR A COMPANIONWAY WAY TURTLE. I HAVE BEEN GIVING SOME THOUGHT TO THAT IDEA. 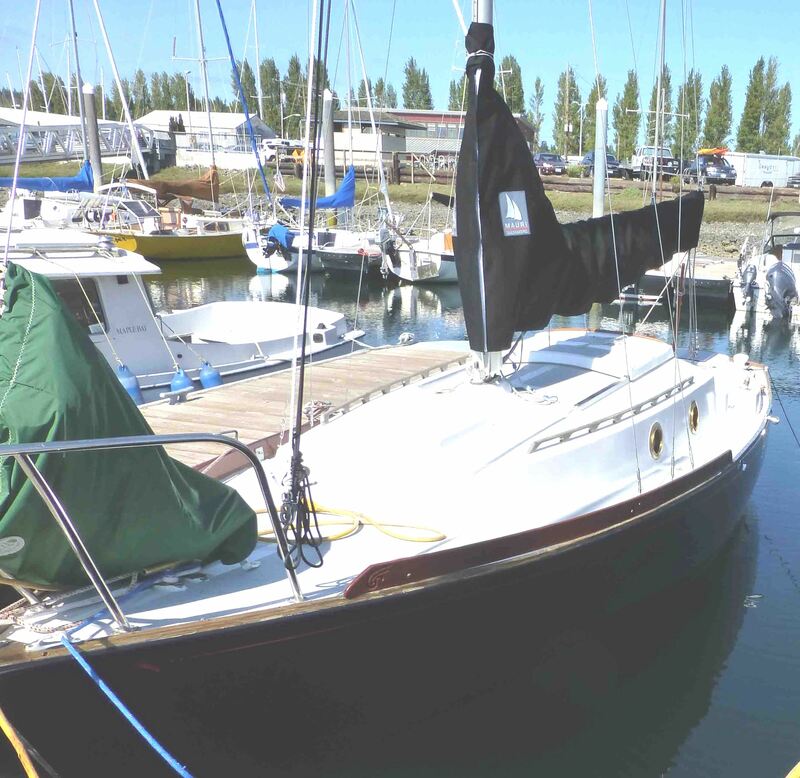 ATTACHED (NEAR TOP OF PAGE) ARE TWO "BEFORE" PHOTOS OF BLUE DOLPHIN AT HAUL OUT -- JUST AFTER I BOUGHT THE BOAT. YOU CAN SEE THE GEL COAT WORN THRU, SO I HAD TO PAINT THE HULL. 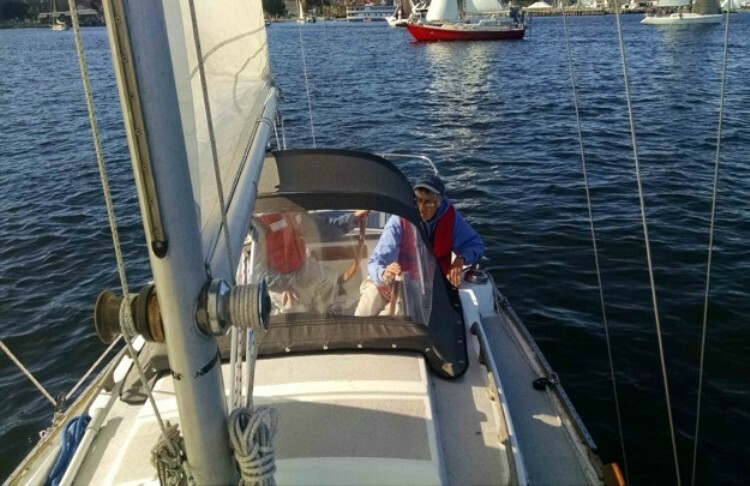 I GAVE UP ON USING THE OUTBOARD WELL - MY TOHATSU IS NEARLY 80 LBS. 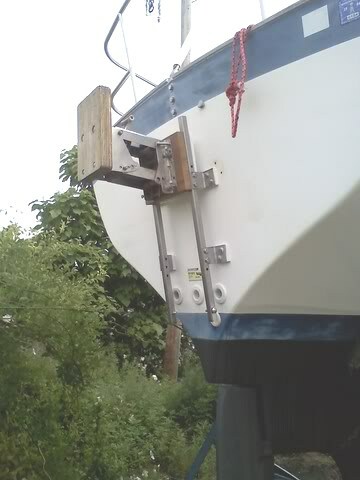 A LIFTING BRACKET OFF THE BACK KEEPS THE OUTBOARD ABOVE THE SALT WHEN NOT IN USE. I FOUND A STERN RAIL ON EBAY AND IT IS INSTALLED NOW. THE STANDING RIGGING TURNED OUT TO BE BAD , SO ALL NEW RIGGING. TURNED OUT TO BE MORE WORK AND EXPENSE THEN EXPECTED, BUT SHE IS A SWEET LITTLE BOAT. January 13, 2015. 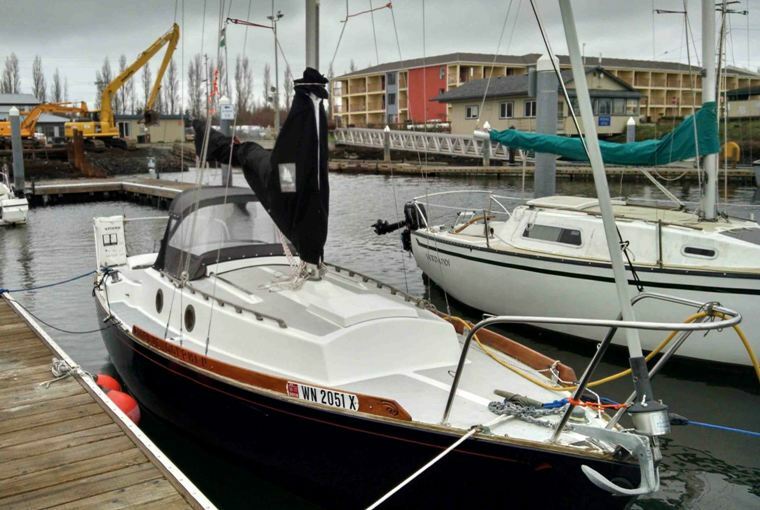 Lon sent in an interesting link to a YouTube video on a Triton's modification so its transom well mounted outboard could tip up the lower unit out of the water. Its in our Technical Section - click here to go there. December 16, 2016. Lon has been working on a dodger for Blue Dolphin, engaging some down under technical advice from Nick King (Pelagos). We have added this to our Technical/Dodgers. TO HAVE A DODGER MADE. I LIKED NICK'S DESIGN, IT SEEMED TO COMPLEMENT THE YANKEE DOLPHIN . JEFF JOHNSON , THE NEW OWNER OF ANCHOR CANVAS HERE IN PORT TOWNSEND, SAID HE COULD DO THE WORK. INSTEAD OF STAINLESS TUBING I SPECIFIED H2UBE. 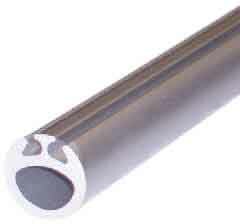 H2UBE IS A THICK WALLED ALUMINUM TUBE WITH A GROOVE TO ACCEPT VINYL BEADED WELT THAT IS SEWN TO THE DODGER CANVAS. THIS AVOIDS THE ZIPPERS THAT ARE USUALLY USED. H2UBE GIVES A NICE CLEAN LOOK TO THE DODGER. JEFF DID A GREAT JOB ON THE DODGER. PHOTOS BELOW. 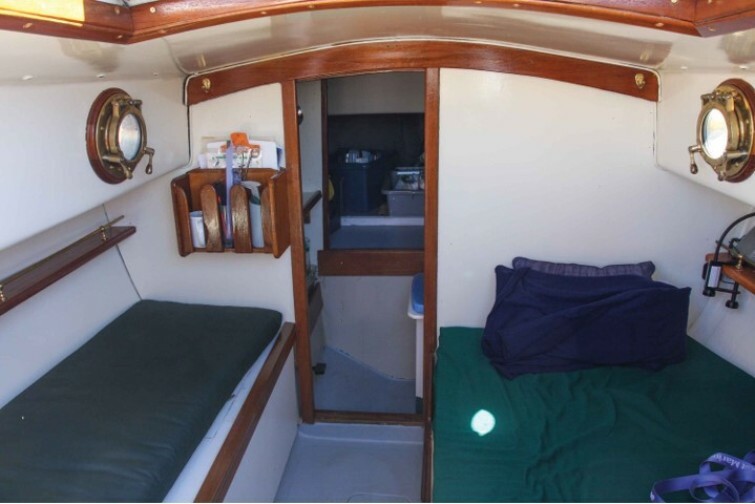 THE DODGER IS LOW ENOUGH TO SEE OVER FROM THE HELM AND HIGH ENOUGH TO ALLOW EASY ACCESS TO THE COMPANIONWAY. Webmaster Note: This one slipped by staff. 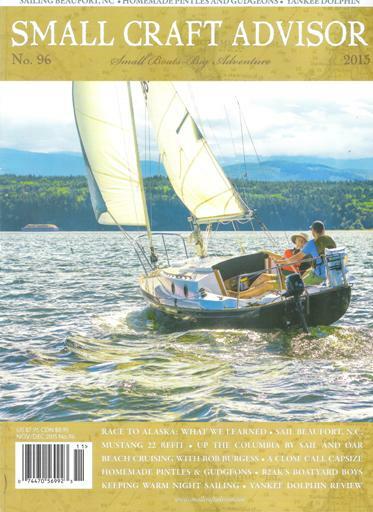 The last issue of the magazine Small Craft Advisor had a 7 page review of the Yankee Dolphin. Blue Dolphin was the cover boat, and the test boat! While we got this news up on the What's New page on November 10 we failed to thank Blue Dolphin on her page. Update January 8, 2016 - click here to see excerpts of this article. I INSTALLED A DODGER AND A COUPLE OF SHELVES INSIDE. PHOTOS ATTACHED. BLUE DOLPHIN STILL LOOKS PRETTY MUCH AS SHE DID IN THE SMALL CRAFT ADVISOR PHOTOS ABOVE. "The third Yankee Dolphin here in Olympia is Alyssum. 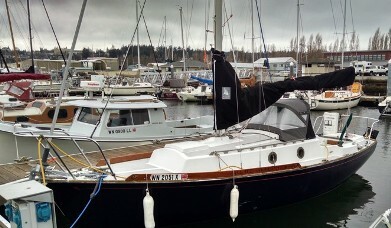 She was owned by Henry Hansen for many years in the 70s and 80s. He may have bought her new. Art Weatherley bought her in about 81-82 and he has sold her to a guy named Martin Singleton. 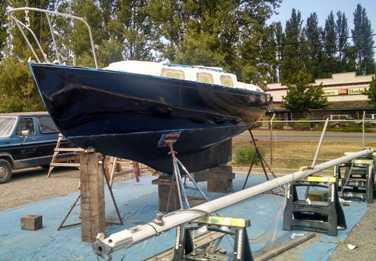 She is one of the later molded hatches/molded interior boats"
"...the hull number is 246. If I remember right Henry Hansen, told me that he had been told it was the last (Yankee) delivered. Henry wanted a bigger Dolphin so he bought a Tartan 30, which I think he still has. 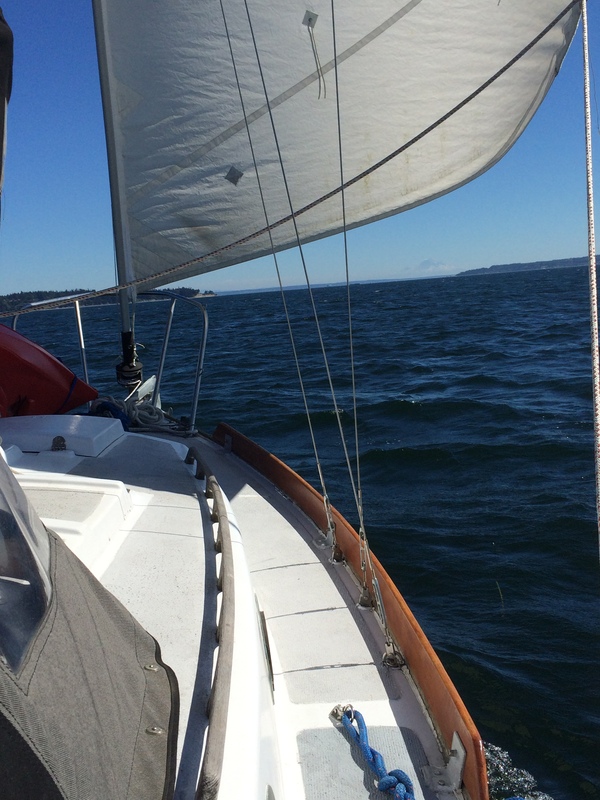 He sails mostly in the winter when the winds blow." October 25, 2010. We had a bit of a mystery here regarding hull numbers #246 and #267 but it has been straighten out . We needed an update from Mike Singleton on what going on with Alyssum. 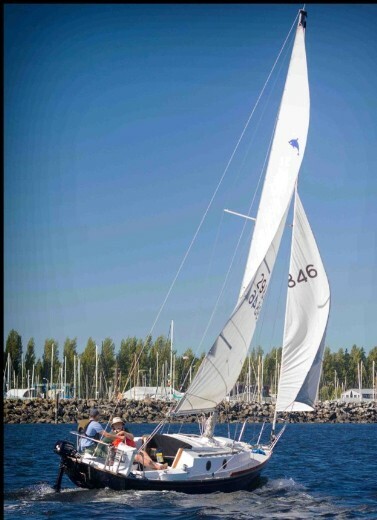 Click here to go to Pacific Dolphin #267.